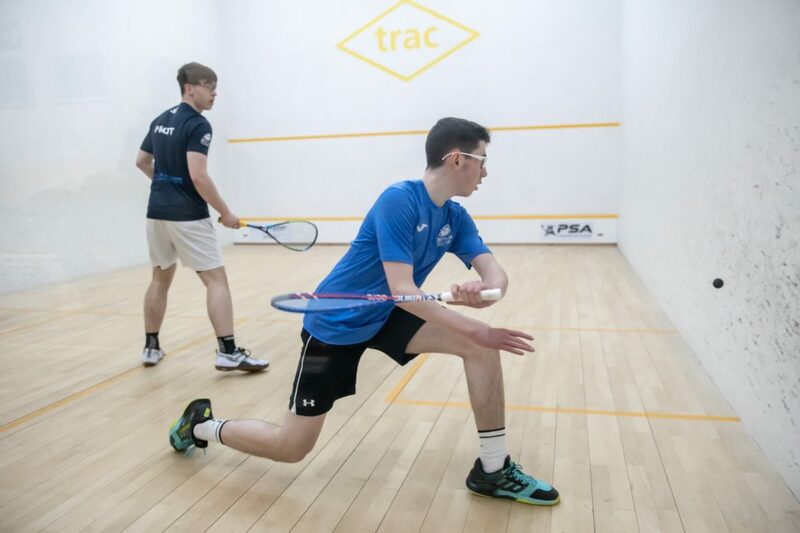 In a fitting conclusion to this year’s Joma Scottish Junior National Championships in Aberdeen on Sunday, eight-time national champion Alasdair Prott (1) took on John Meehan, who was aiming for his first national title in the BU19 final. 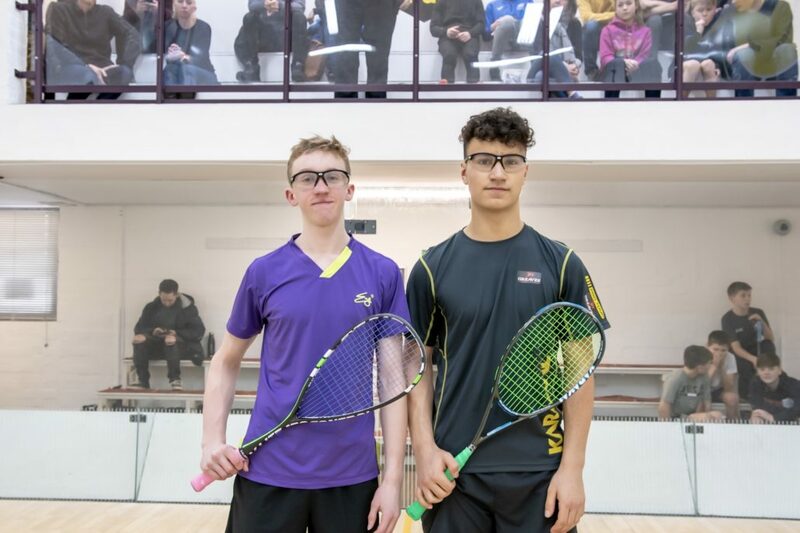 It was second seed Meehan who secured a tense four game victory over his rival on showcourt seven at Aberdeen Squash & Racketball Club (ASRC). The Strathgryffe player sealed a thrilling 12-10, 9-11, 11-2, 11-9 win over Inverness ace Prott, withstanding a fightback by the top seed in game four to earn the biggest title of his career to date. 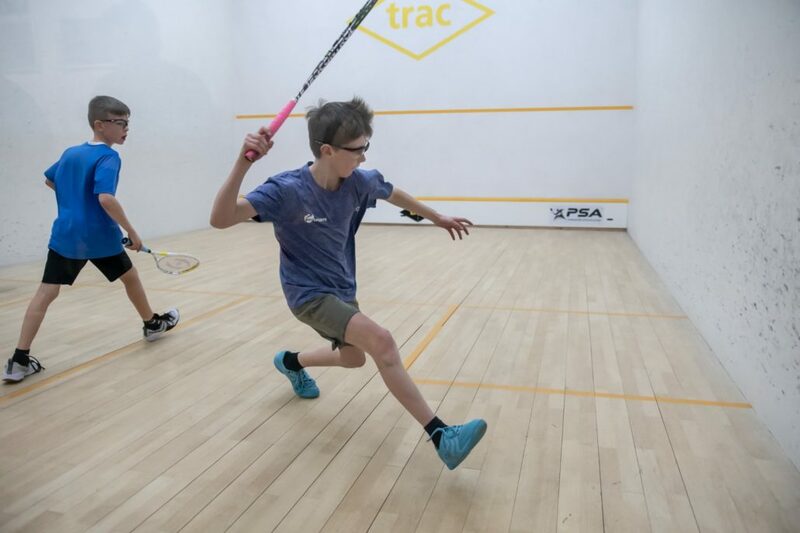 It followed an impressive victory over Newlands’ Fraser McCann (3) in the semi-finals which saw John come from behind to beat the third seed 6-11, 11-6, 11-7, 11-7. Fraser claimed bronze beating Nairn’s Harry Barron (4) in the 3/4 play-off, winning 11-5, 11-4, 14-12. 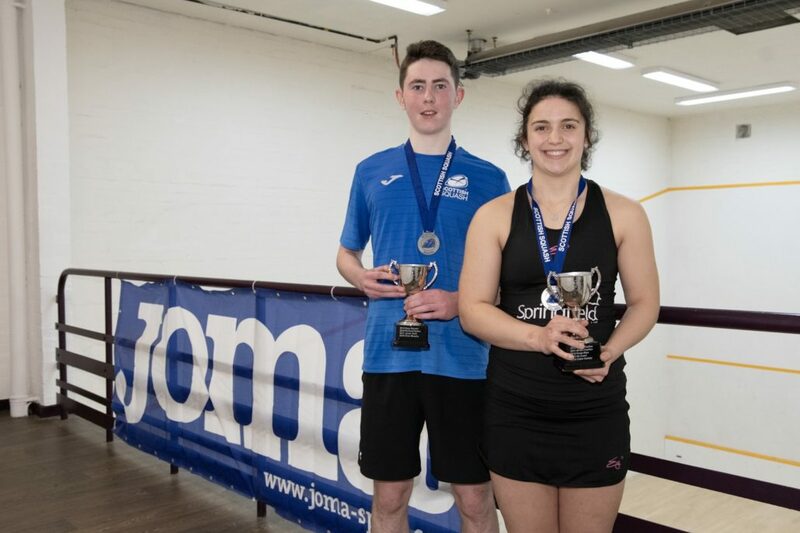 John, below with GU19 champion Georgia Adderley, said: “I am really buzzing and proud to have won. “I have won a couple of big European tournaments but this is the big one for me, tops the lot. “I have always wanted to win a national title and would have begun to doubt things if I hadn’t got through this. “Congratulations to Alasdair for a really great final. “I knew it was going to be hard, even when I went 2-1 up and was leading in the fourth. “He is such a fighter and I never thought it was finished until the last point. He never gives up. He continued: “The last six months I’ve really changed my mindset. I have more belief in myself and I’m better tactically. It’s made the world of difference. “Every match I’m going in backing myself to play my best squash whereas before I let myself down mentally. “I know Alasdair is a really good runner and he works the ball around court so I had to be prepared to move everywhere and anticipate that. John’s Strathgryffe training partner Ruadhri McDougall (2) was also celebrating on Sunday evening after claiming the BU17 title. He defeated Glasgow’s Andrew Glen (1), coming back from a first game wobble to win in four, 0-11, 11-7, 11-6, 11-7. The top seeds both won in straight games on route to the final. Ruadhri, pictured below with Andrew, said: “I was pretty nervous going into the final which was reflective of the scoreline in the first game. “There is no way you can come back from that if you don’t refocus. “I had to re-evaluate my game. I think I was a bit too passive, not really going for anything risky. He added: “I have played Andrew a few times before and in the middle of the court there’s a lot of traffic. “We are both trying to get to the ball and at the higher level in squash it can get more physical. “I’ve been working on a lot of middle of the court stuff, cutting the ball off early and trying to volley more because when you control the middle of the court you can control the match. Crieff’s Ben Orr (3) sealed third place in the bronze medal match, beating fourth seed Adam Hunter from Giffnock, 9-11, 11-0, 11-4, 11-7. 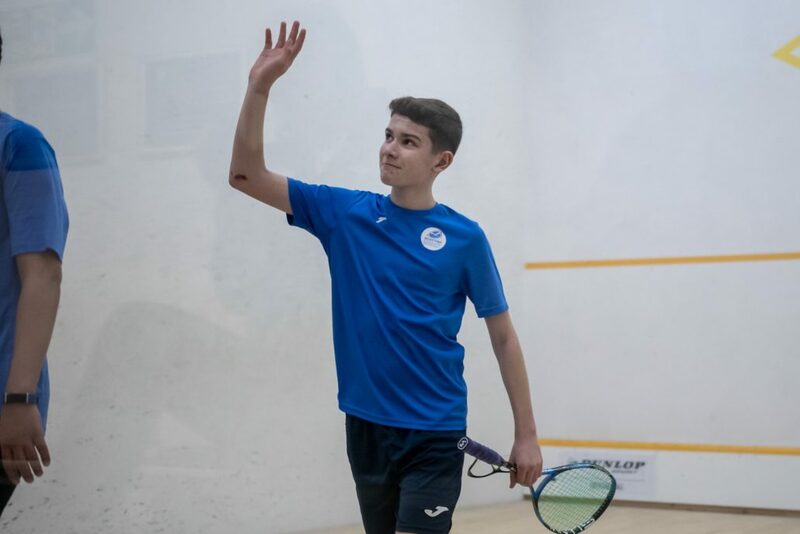 Edinburgh’s Rory Richmond (1) secured his maiden national title reversing the scoreline of the BU13 gold medal match against Huzaifah Ali (2) two years ago. Rory defeated Huzaifah in the BU15 final 11-6, 11-8, 11-4 on court seven. He showed good character throughout the tournament, not dropping a game despite some tight encounters. 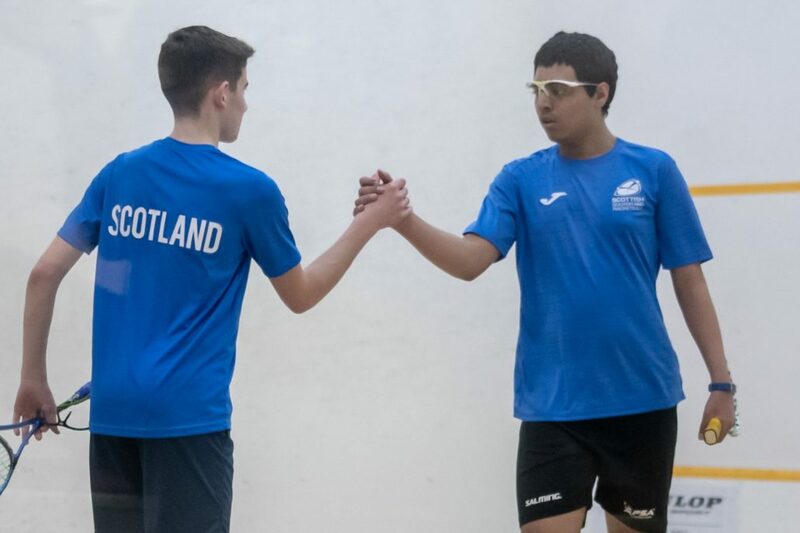 The Edinburgh Sports Club (ESC) player, below, said: “It’s a really good feeling and I’m happy to finally win a national title having reached the semi’s last year and the final against Huzaifah in 2017. “I’ve been putting lots of effort in with Simon (Boughton) and Kevin (Moran) at ESC and have done my first Academy session which I enjoyed. He added: “The final was difficult, I had to stick in there. Third seed Kyle Penman from Bridge of Allan won bronze thanks to a four game victory over Strathgryffe’s Findlay McDougall, 11-1, 11-6, 9-11, 11-6. Waverley’s Sam Shannon ensured further East coast success after beating his regional training partner John Green (2) in the BU13 final. Top seed Sam had a relatively comfortable path to the final but John provided stiff opposition in the final, Sam prevailing, 11-2, 11-9, 11-8. A delighted Sam, 12, said: “It’s my first national title and I’m very happy. “I played quite well although made a few errors along the way. “I have been training hard with the East squad and Kevin Moran which has improved my game a lot. “I’m trying not to show too much emotion on court and focus mentally. He added: “John (Green) is younger and very talented. Third seed Charlie Henderson from Giffnock went home with bronze courtesy of an 11-6, 11-9, 11-5 win over Kinross’s James Beaumont (5). 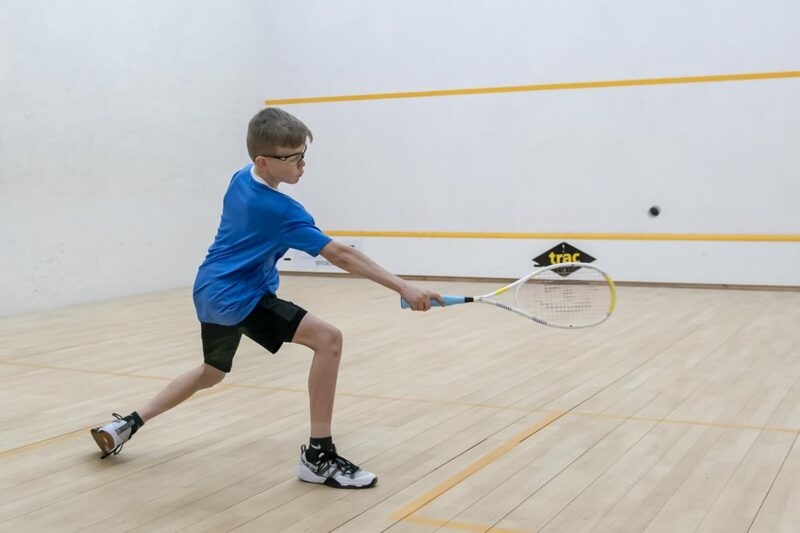 To go with his BU13 silver medal, Watsonian’s John Green deservedly defended his BU11 title to prove he is a name to look out for in the future. He won all three of his round-robin matches with his 11-3, 11-3, 11-3 win over Zack Paton on Sunday morning sealing gold. 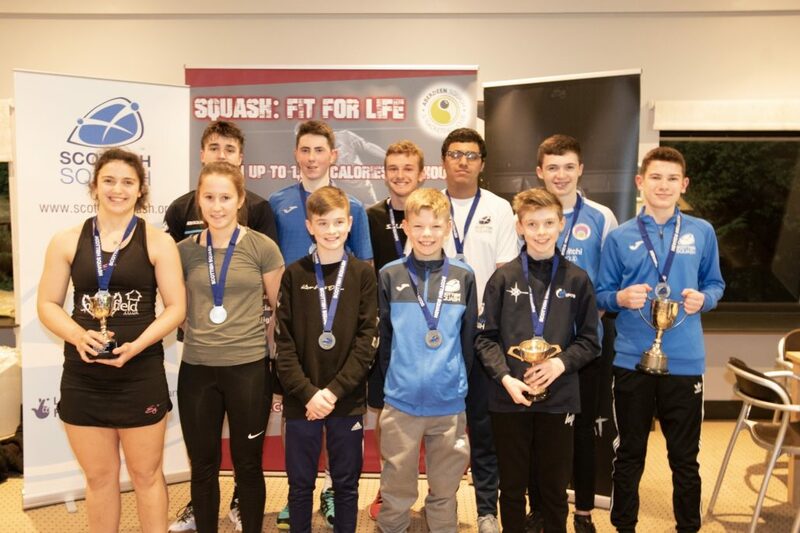 Zack’s two wins sealed second place for the Nairn youngster whilst Tyne and District Squash Club’s Jamie Pearman won bronze. For all results and placings, click here. Read the Girls’ report here.